Surrounded by magnificent pine trees, Pine Cliffs Resort overlooks mile upon mile of unspoiled golden sandy beaches, and is one of the Algarve's most prestigious and exclusive resorts. 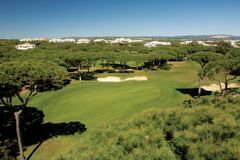 With the legendary nine-hole Pine Cliffs golf course on site, the Pine Cliffs Resort has it all, and is perfect for a luxury holiday in Southern Algarve. Challenge the ‘Devil's Parlour', the famous gorge that cuts through the Pine Cliffs course that has made it one of the most photographed golfing scenes in the world! Pine Cliffs is one of the world's most renowned nine-hole courses. This is largely due to the 6th hole, an awe-inspiring par-3 where golfers tee off from the edge of the cliffs above the shoreline, and are faced with a tee shot over the infamous ‘Devil's Parlour'! The luxury 5* hotel is a fine example of traditional Portuguese architecture, with considerable Moorish influence, while inside you will find a tranquil and airy environment. The hotel has a total of 215 exquisite guest bedrooms, all fully air-conditioned, including a number of opulent suites. The rooms are decorated in a simple, elegant style, but exude pure luxury. For a special occasion, be sure to choose one of the sea view rooms, from which you can gaze out over the Algarve's famous coastline from the idyllic cliff-top location. The unspoiled Falésia Beach is the only one in the Algarve to be awarded the EU's Golden Flag, and is the ideal place to enjoy the region's reliable sunshine. The hotel also has 5 tennis courts, a comprehensive kids club and an excellent health and fitness club. Guests can use the sauna, jacuzzi, and the stunning outdoor swimming pools, while the Estética Spa has a fantastic range of treatments to ensure your total relaxation. Pine Cliffs Resort has a number of excellent restaurants, but if we had to choose one, it would be O Pescador, which is widely regarded as one of Portgual's finest seafood dining rooms. The Portulano bar is a great cocktail bar with regular live entertainment, while from the Mirador Bar you can stare over your drink and out to sea while the sun sets. Nice looking course, not in the best condition. Staff didn't want to make us food when we still had 40 mins to tee off.